Do you have a fire extinguisher? If you don’t, it’s time to add it to your shopping list. Every homeowner should have one on each floor or area of their home and know how to use it. Fire extinguishers are life savers. Make sure to purchase one from a reputable manufacturer. 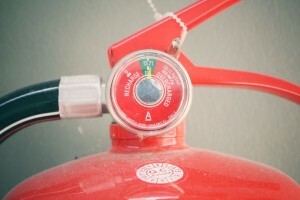 Class A fire extinguishers are designed to put out fires involving paper, wood and plastics. rubbish, wood, and paper fires; Class B are for flammable liquids such as oil and grease. oil and grease fires; and Class C are for electrical fires. Class ABC models work on all the fires above. The higher the rating number on an A or B fire extinguisher, the more fire it can extinguish. But higher-rated units are often heavier — too heavy for some people to hold and operate. If you’re buying a fire extinguisher, make sure you, a member of your family or co-worker, can easily pick it up and use it. Do you know how to use a fire extinguisher? In an emergency, fire fighters say many people can’t get one to work on the first try. Read the informational material that comes with your device. Consider having local fire department personnel show you how or attend a training class. The acronym PASS can help you remember the basics of operation: Pull the pin to release the handle, aim the extinguisher at the base of the fire, squeeze the trigger, and sweep the discharge stream at the base of the fire. Fire extinguishers are not designed to fight a large or spreading fire. Even against small fires, they are useful only under the right conditions, such as when a fire is confined to a small area, such as a wastebasket; when everyone has exited the building; after the fire department has been called or is being called; and if the room is not filled with smoke.